The Walters family of Manangatang, North West Victoria, have thanked the operating efficiencies of their new Croplands Equipment 1386 Rogator crop sprayer for getting them through a tough start to the year that has seen more than 12 inches of rain falling on the district's Mallee-type country. Despite having seen the area's annual rainfall in the space of a month, with a bit of share farming Trevor Walters has been able to put in about 12,500 acres of cereal and canola with his 1386 Rogator self propelled crop sprayer. Having made the decision to move to specialist spraying machines some three years ago and having since owned a 1274C Rogator crop sprayer, Walters has racked up plenty of experience using Rogator technology. With some 1700 hours on the 1274C crop sprayer, and with “excellent service and warranty” attributes, Walters says he found Croplands Equipment to be “a good company to deal with. With his new 1386 Rogator self propelled crop sprayer, Walters has been able to increase efficiency by 20 percent, particularly aided by the unit's wider boom. Today, Walter operates with a 120ft boom, and enjoys an increased tank capacity of just over 6000L from the previous 5000L that allows a further lift in operational capacity. All of which, he says, adds up to getting more done with less fills. “Our spraying window is reasonably small and we like to keep the Delta-T levels right for ideal spraying,” says Walters. “You need to either spray at night – and we have found the machine very good from the perspective of its lights – or start very early in the morning and try and get two or three tanks out before it warms up,” he adds. Walters says it is difficult to pinpoint hourly outputs turned in by the new 1386 Rogator self propelled crop sprayer, however, he is able to cover 1500-plus acres in daylight hours, by which time the unit's tank has usually been re-filled six times. Walters promotes his new 1386 Rogator crop sprayer as having a very good filling system, a smooth hydrostatic drive system, and a highly reliable Caterpillar engine. He says the lift in engine rating from 295hp to 311hp is plainly evident when tackling any rises the machine encounters. “You can feel the increase in power of the motor even though the machine is a bit bigger and heavier,” he says. “Being hydrostatic, we know we can push it quite hard to achieve high work rates, and if you‟ve had a bit of rain, and when the conditions aren't dusty, you can spray pretty quickly – up around 30kph,” he adds. The ride afforded by the 1386 Rogator self propelled crop sprayer is also said to be very smooth, thanks to it's air-bag suspension system. Factoring in the season's predominately muddy conditions, Walters says the crop sprayer's 4WD system has come into its own, helping to keep the unit on top, something especially beneficial in the recent abnormal conditions. When it comes to the booms, Walters is yet to fit an automatic height control system, however the interim report is of the boom being both stable and robust. The folding system of the boom delivers a better operational outcome, offering much greater visibility when travelling down the road. This is aided by the enhanced view from the cab. “If you do happen to hit something, [the boom] folds back extremely well and doesn't knock jets off, getting back into position reasonably quickly,” says Walters. 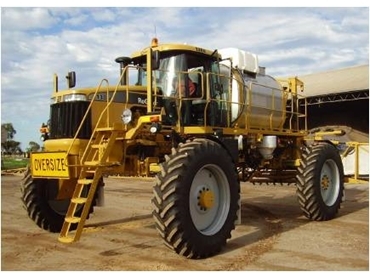 Walters also gives special mention to the 1386 Rogator crop sprayer's height, which is good for late season spraying because the top of crops are not knocked off and it is possible to spray the often tall canola. Cab access is also complimented by Walters, who notes the front mounted steps as being much easier than the previous side mounted configuration which required the operator to duck under the boom. Finally, Walters drew attention to the 1386 Rogator crop sprayer being very health and safety compliant, offering a chemical and dust-free cab environment through proven filtration systems. He also gave special mention to the unit's efficient water and chemical transfer. The Walters family expects Rogator crop sprayers, like its new 1386 model, to cover between 500 to 600 hours a year, thereby quickly earning their keep.